Our story began in 1993 when four Traditional Owners, David Mowaljarlai, Laurie Gawanulli, Paddy Wamma and Paddy Neowarra (all deceased) were seeking to ‘build bridges of two-way understanding and two-way learning’ between traditional Kimberley Aborigines and non–Aboriginal people. These old men were concerned that their culture, their law and traditions were being lost to future generations of Aborigines. They were neither known nor understood by other Australians. They approached Kimberley Foundation Australia Director Susan Bradley to encourage people of influence to visit the Kimberley so that these old men could share stories of their country. Susan brought in fellow KFA Director Christina Kennedy and the ‘Bush University’ was formed. People from all walks of life came to the North Kimberley to experience the power and spirituality of the Ngarinyin*, their land, their law, their art and their ceremony. The Bush University eventually became known in 1997 as the Wandjina* Foundation. It was renamed the Kimberley Foundation Australia in 2002 to reflect its broader objectives. This year KFA celebrates its 20th anniversary. The Kimberley Foundation Australia has been formally funding academic research in the Kimberley since 2007. The Ian Potter Foundation gave us our first significant grant that year to advance a Kimberley Regional Human and Environmental History Program. Since then KFA has supported teams of archaeologists, climatologists, geochronologists and palaeoecologists to work in partnership with Aboriginal communities. * The Wanjina people comprise three tribes: Ngarinyin (the largest group), the Worrora and the Wunumbal. Andrew and I fully support the research work undertaken by the Kimberley Foundation Australia. Supporting their rock art dating project is an investment in Australia’s cultural heritage. The scale and wealth of expertise involved in the project is a world first. 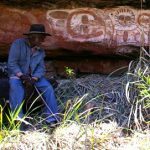 We encourage you to support their work and contribute to the long-term protection of Kimberley rock art. 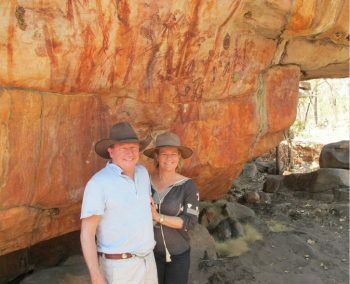 KFA patrons Andrew and Nicola Forrest at Kimberley rock art site.